Excellent customer service, I've been coming here since I left Dublin back in the 90's, they make you feel welcome all the time! I have been using Akhtar's for a number of years now and they have always been curteous, helpful and highly informative to the extent that when I get a prescription I always check with the first to ensure it is the correct medicine for my ailment. theay are always happy to spend time explaining all the ins and outs of the medicine and any side effects. I would never use any other chemist. when my father was very ill and they did not have one of his medicines he got hold of it quickly and instead of making him return they delivered it to the house so as not to inconvenience him. delighful family run business with even more delightful people. i am a local man born and bred. 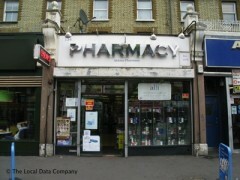 for many years, mostly because of poorish health, i have frequented chemists in and around cricklewood. in my view akhtars provide a service superior to its many competitors. dave, and his team, are extra helpful and will always go that little bit further to help its customers. I am English born and live in the USA now. Akhtar Pharmacy in Cricklewood Broadway was extremely helpful in finding several items for me and even called another Pharmacy to see if they had an item before sending me there. We are both now trying to locate Grethers Blackcurrent pastilles.